Stumble into Durham Academy's Taylor Hall on a Wednesday morning before the start of school, and you might be surprised by what you see: students and faculty sitting quietly upon yoga mats, or walking slowly around the auditorium. The scene is in stark contrast to the hustle and bustle that you might see elsewhere at that early hour — and that's the point of the Middle School's morning mindfulness sessions. "If someone came in here and saw us, they might think here are a bunch of people wandering," said Dr. Bart Brigidi, as he led the group through a mindful walking exercise on a recent morning. "But this is a skill. To be able to focus on one thing — the sensation of walking — will help you if you master being here and present. I'd rather us wander in this room right here than wander in life." 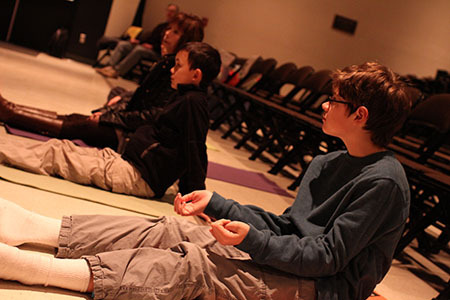 The Middle School recently hosted its fifth weekly mindfulness session, and despite the early hour, about 10 students and four faculty members have participated regularly. The idea to host weekly sessions came after the success of schoolwide mindfulness workshops over the past couple of years. Those workshops have included educating students about the benefits of mindfulness practices (including a viewing of a video of former NBA coach Phil Jackson touting the positive impact of such techniques on his players) and leading each advisory group through a series of developmentally appropriate techniques like yoga and mediation. Brigidi — a clinical neuropsychologist, associate director of the Laboratory of NeuroGenetics at Duke University and a parent of two DA Lower Schoolers — helped organize the schoolwide workshops with Middle School counselor Jeff Parkin and is volunteering his time and expertise for the weekly sessions. "One of the important things with this kind of work is it can become a regular healthy habit. We had a lot of success with the workshops, and there was interest from students, faculty and parents," he said. "I thought maybe a next step would be to offer something that's more regular." The weekly sessions are held each Wednesday from 7:15 to 7:45 a.m. in Taylor Hall, and students and faculty are welcome to quietly drop in at any point during that time. After the program is more established, there is a possibility of opening it up to parents as well. Eighth-grader Carl May has attended all but one of the sessions. He had practiced mindfulness techniques on occasion prior to the morning sessions at DA, but not regularly. "Honestly, I am really thankful that they're doing this because I'm able to participate in this every single week instead of just once a year," he said. "I'd say that the big thing about it is when you're going about your daily business during the day, your mind is working a million miles an hour. If you can manage to maintain your focus on your breathing or some other anchor in the room, it can be very relaxing." Each session follows the same format: brain warm-ups (on a recent morning, this involved passing around essential oils and focusing on their smell, while putting aside feelings that they invoked); a sitting meditation guided by Brigidi; a mindful movement exercise (such as walking or fluid movement); and an unguided meditation. 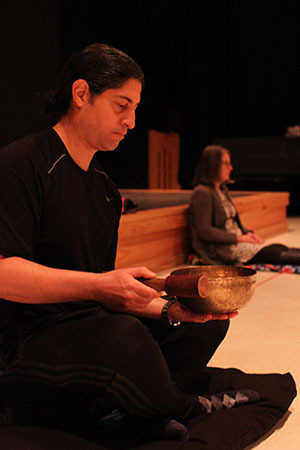 During the guided meditation portion of a recent session, Brigidi led students and faculty through an exercise to help them focus on their breathing. "If you notice your mind drifting to anything but your breathing, just turn your mind's eye back to your breathing. In. Out. In. Out," he said, speaking softly and slowly. "We're now settling into a calmness that's both helpful and healthy. Alert and focused, but calm. Breathing in. Breathing out." The goal is to introduce students and faculty to techniques that they can practice throughout the week if they're feeling unfocused or stressed. "I think especially sometimes when I'm getting a little bit stressed or nervous about something, it helps me to stop thinking about it for just a minute and try to focus on my breath or something else," said eighth-grader Shan Wang, who has attended each of the weekly sessions. "I think this class has really helped me be able to do that and stay focused on something that's not the biggest thing in my mind." Another technique introduced in the most recent class was progressive muscle relaxation, a mindfulness practice that involves tightening and then relaxing muscles, one section of the body at a time. "I think I'm going to do that more often because that seemed to really work for me," May said. "It almost felt like a stress ball, except you could use any muscle you want." Mindfulness and meditation are known for helping to relieve stress, but there's much more to the practices than stress-reduction, Brigidi says. Practicing mindfulness has been shown to have numerous health benefits, from immune functioning to cardiovascular functioning, and of course, psychological health. "In general, there are lots of published studies — but it's really based on common sense — that show that in life, we're often moving a lot and doing a lot of things, and we don't give enough time to stop and stay still and pay attention to what we're doing in a thoughtful way," he said. "One benefit of mindfulness in general is to notice the world as it is and all of the feelings and thoughts that brings up — some are pleasant, some are unpleasant — but just to notice without judgment, and that in fact is the skill." Parkin sees mindfulness as particularly beneficial for the middle school set, given all of the physical, social and emotional changes students undergo during their pre-teen and early teenage years. "I think it's just so much a part of a middle schooler's life that they live to varying degrees outside of themselves," he said. "How do I look, how am I presenting myself, am I smart — all of those normal things that can take away from what the person is at their core. This is a way that can bring them back to that — a kind of hopefully calmer center out of which things are clearer. "Especially with the high level of accomplishment in so many areas that our kids experience, it's a way to make them even more resilient and help them to bounce back from a setback," Parkin continued. For Wang, the lessons of the morning mindfulness sessions stick with him throughout the week. "It's great to have in the middle of the week, with all the stuff that's going on with schoolwork and sports," he said. "It's great for 30 minutes to be able to relax, and that helps me have focus and be relaxed for the rest of the week."